No one has previously done a careful before-and-after comparison of how the flows of CO2 between the land and the atmosphere change for a real-world case of burning a biofuel instead of a fossil fuel. The operative word here is flows, referring not only to the greenhouse gas (GHG) emissions flowing upward into the atmosphere but also to the downward flow of CO2 from the atmosphere into the biosphere as plants grow. Our new study performed just such an evaluation, looking at the first-year operation of a particular corn ethanol facility and the farmland serving it. When tallying all of the key carbon flows for the processes directly involved -- including oil production, farming, petroleum refining, biorefining and fuel consumption -- the data show that substituting ethanol for gasoline resulted in no significant change in net CO2 emissions. 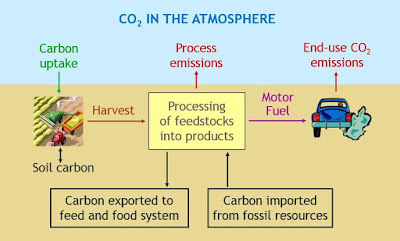 extent that carbon uptake increases when a biofuel's feedstock is produced. Moreover, the corn ethanol we evaluated reflects a best-case situation. Because the farms serving the facility shifted from growing nearly half soybeans to growing all corn, the first year of biofuel production took advantage of a large one-time gain in carbon uptake by newly planted corn in order to balance out the CO2 emissions from fuel consumption and processing. Analysis of more typical situations indicates that the net GHG impact of ethanol is likely to be much worse on average. Biofuels have been getting a bad rap recently and so one might ask, "Isn't this just yet another study criticizing corn ethanol?" What is distinctive here is the use of a scientifically rigorous method termed annual basis carbon (ABC) accounting rather than the lifecycle assessment (LCA) methods that are commonly used. ABC analysis gives results very different than those of an LCA using identical data. The study examined a state-of-the-art corn ethanol biorefinery in Illinois that had been previously analyzed using Argonne National Laboratory's GREET model, an LCA tool also adapted to regulate fuels under California's Low-Carbon Fuel Standard (LCFS). According to GREET, ethanol from the facility cut greenhouse gas (GHG) emissions by 40% compared to ordinary gasoline. In contrast, the ABC analysis found no significant reduction of emissions. 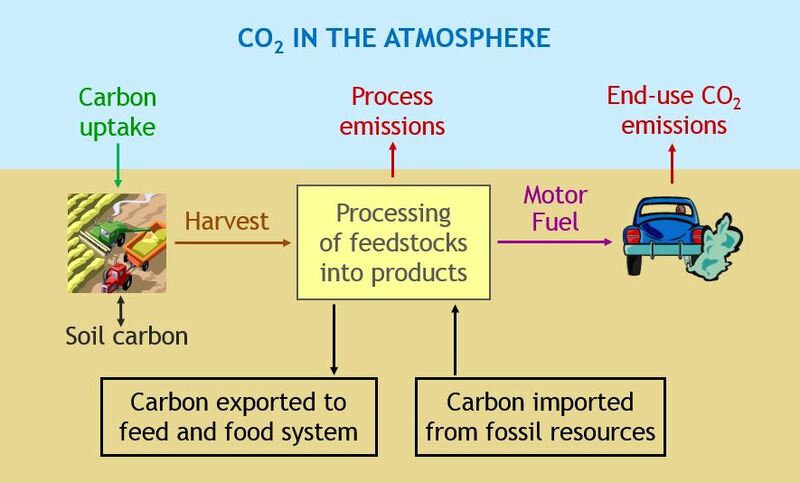 The reason for this stark difference is that GREET's lifecycle comparison neglects the fact that the farmland supplying the biorefinery was already growing crops for other purposes -- and therefore already absorbing CO2 -- before its harvest was used to make ethanol. LCA models such as GREET claim to account for all emissions from "well-to-wheels" (or "farm-to-wheels") as they say. Although it may account for all of the CO2 being discharged into the air, where LCA goes wrong is in not counting all of the "negative emissions," that is, CO2 being removed from the atmosphere through plant growth. Correcting this mistake by carefully accounting for CO2 uptake greatly changes the picture. Bringing the analysis of biofuels back down to earth shows that they will worsen rather than lessen climate risk for the foreseeable future, underscoring the need to reform energy policy accordingly.